AArch64_MachoTargetObjectFile - This TLOF implementation is used for Darwin. Definition at line 24 of file AArch64TargetObjectFile.h. Definition at line 29 of file AArch64TargetObjectFile.cpp. Definition at line 55 of file AArch64TargetObjectFile.cpp. 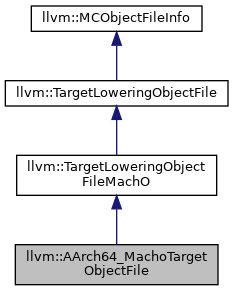 Definition at line 61 of file AArch64TargetObjectFile.cpp. References assert(), llvm::MCSymbolRefExpr::create(), llvm::MCBinaryExpr::createSub(), llvm::MCContext::createTempSymbol(), llvm::MCStreamer::EmitLabel(), llvm::MCValue::getConstant(), llvm::TargetLoweringObjectFile::getContext(), and llvm::MCSymbolRefExpr::VK_GOT. Definition at line 76 of file AArch64TargetObjectFile.cpp. Definition at line 34 of file AArch64TargetObjectFile.cpp. References llvm::MCSymbolRefExpr::create(), llvm::MCBinaryExpr::createSub(), llvm::MCContext::createTempSymbol(), llvm::dwarf::DW_EH_PE_indirect, llvm::dwarf::DW_EH_PE_pcrel, llvm::MCStreamer::EmitLabel(), llvm::TargetLoweringObjectFile::getContext(), llvm::TargetMachine::getSymbol(), llvm::TargetLoweringObjectFileMachO::getTTypeGlobalReference(), and llvm::MCSymbolRefExpr::VK_GOT.